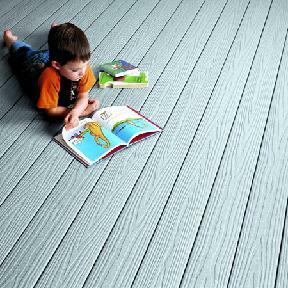 CertainTeed composite and vinyl decks have a splinter-free surface that's slip-resistant and safe, even for toddlers. Composite and vinyl decks never need painting or staining, don't splinter or rot, and never have exposed hardware to reset. Except for an occasional cleaning with a garden hose, vinyl and composite decks are virtually maintenance-free, and perfect for the four-season weather. Certainteed composite decking is the ultimate decking material. 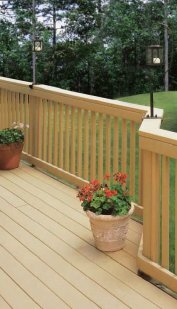 Certainteed composite decking lasts longer than wood, and doesn't need board replacement every few years like most wood decks. 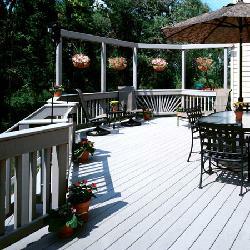 Unlike wood decks, there is no rotting, cracking, or splitting with a Certainteed composite deck. These decks are stronger, more durable, and more reliable than the recycled plastic lumber that is used on some New Jersey decks. Virtually maintenance-free Certainteed composite decking provides barefoot comfort with a no-snag surface that's free of nails, splinters or screws. Composite decking also performs well when installed on docks and marinas. 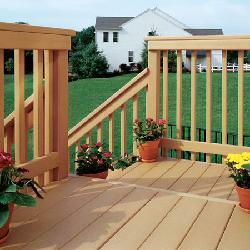 CertainTeed composite and vinyl decks stand up to the New England elements and provide excellent weatherability. There is never a need to apply paint or stain and composite and vinyl decks are easy to clean with most deck wash products. CertainTeed Boardwalk composite decking stays smooth and beautiful for years. It is virtually impervious to insect damage and the adverse effects of weather. This composite decking boasts a consistent quality and appearance, meets ADA recommendations for slip resistance, and has a Class 1 fire rating. 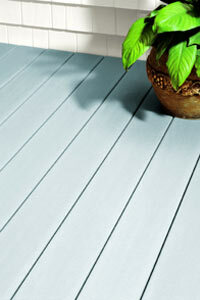 CertainTeed Boardwalk composite decking also comes with a 10-year limited warranty. We invites homeowners to call us to discuss the benefits of composite or vinyl decking for your home! There are several situations that call for the installation of railing. As a porch enclosure, railing provides much more than safety -- it helps turn a front porch into an elegant entry into your home or a friendly meeting place for friends and family. 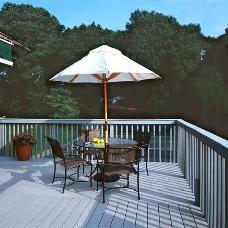 Top-quality railing can also enhance the appearance of any deck or gazebo. And balconies, whether they're inside your home or out, should enjoy the same attention to detail. Vinyl railing systems offer more than traditional wood styling without the maintenance. You get aluminum reinforced rails, secure metal-to-metal post connections, precision-routed rails and a lifetime warranty. CertainTeed railing systems are designed with safety in mind and comply with international residential and building codes.